I don't think there's a school, club, pub, business or community group in Lake Macquarie which has not contributed in some way towards helping those affected by the drought. I am extremely proud to represent this community in the Parliament and extremely proud of the way we pull together when needed. Mr GREG PIPER (Lake Macquarie) (19:09): It's been a while since Australia's prosperity rode on the sheep's back, but while our farmers and agricultural sector are a smaller part of our national economy these days, their place in our hearts, our history and cultural identity remain as large as ever. I note that the member for Tamworth and the member for Northern Tablelands are in the Chamber. I am sure the issues I will be talking about in this private members' statement will be very close to their hearts. Perhaps it is because our climate has always presented such difficult hurdles and hardships for our primary producers—when it rains it pours, and when it does not rain, it does not rain for months or even years. The drought currently gripping this State is among the worst on record. It is frightening to think that these extremes in climate patterns will become more frequent for future generations as climate change deepens. The Government has been doing its bit to assist our drought?ravaged farmers, and there is a fair argument that more can be done, but I wanted to inform the House about some of the incredible assistance coming from communities around the State and nation, including in my electorate of Lake Macquarie. While we are a regional electorate full of busy small towns, we are close to significant rural and agricultural regions that are suffering badly. We know the hardships being faced by farmers producing our food, meat and poultry, grain and dairy, fruits and vegetables, even our wines and cheese. When they need a hand the community is quick to extend one. We didn't want to make a big scene because that's the last thing these farmers needed or wanted. We put a few accounts into credit so the next time they went in to get stock feed or produce, they knew they could cover the cost. Of course, Shane and partner, Bianca, did not do it all alone. Hundreds of volunteers stepped in to fill all the gaps. Late last month, for example, the guys at Wangi Mens Shed hosted a garage sale to raise funds for farmers up at Merriwa in the Hunter Valley. Wangi Wangi is among the many small waterfront communities around Lake Macquarie that never hesitates to dig deep when needed. The garage sale raised $9,000 from selling unwanted household items that had been donated by the locals. Shed president Peter Garland said the amount more than doubled any previous fundraising effort held at the shed. All of it was delivered in a cheque to Merriwa Country Women's Association, which will no doubt make sure the help goes to where it is needed. The Wangi Wangi community did not stop there. Only last week, the Hotel Wangi hosted a "Buy a Bale" event with the aim of raising $9,500 tobe used to fill a semitrailer with hay for starving cattle out west. Other businesses got involved, including Wangi Workers Club, which held a country music night at the club, and the town's small businesses all chipped in with cash donations. Not only did the small community fill a semitrailer with hay, they raised a further $30,000—more than three times the original target. Organiser Peter Coyne said, "People just kept putting their hands up to help. It was an unbelievable amount of money raised from a relatively small community." It was certainly that; a small community doing very big things. I am proud to say that this is typical of many communities in Lake Macquarie that are chipping in when the chips are down for New South Wales farmers. I know that many Australians are pulling together, as they always do when natural disaster, including drought, hits hard. But it is important that we recognise and thank them, even though they are not looking for any recognition. 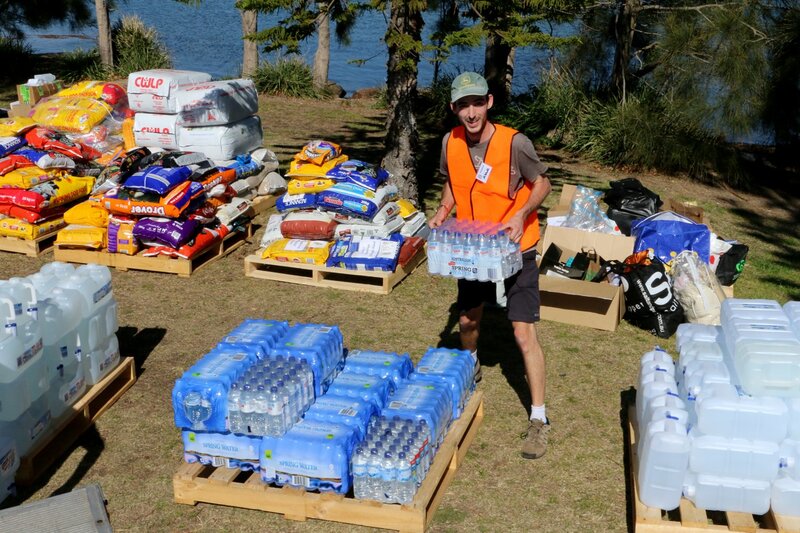 There is hardly a school, club, pub or community in Lake Macquarie that has not contributed in some way towards helping those affected by the drought. I am extremely proud to represent those communities in the Parliament, and grateful that I can recognise their efforts in the House. TEMPORARY SPEAKER (Ms Sonia Hornery): Our office donated five carloads of goods from the community. I visited Lake Macquarie on that Saturday. It was great. It was a wonderful initiative, and I also thank Shane and Bianca.